RESEARCH: Alexander ceramics were first recognized in the middle Tennessee valley of northern Alabama in the Wheeler Reservoir area by John Griffin and William G. Hagg in 1939. Caryn Hollingsworth mentioned this type in his research at the Sheeps Bluff Shelter site in 1991. [i] The Sheeps Bluff Shelter site is located in Franklin County, Alabama. TEMPER: Sand was used as temper in this type. SURFACE DECORATION: These are systematic punctations with clay ridges. The punctations are carefully arranged in closely spaced parallel horizontal rows to decorate the top of the vessels. The remaining body of the vessel was undecorated. VESSEL FORMS: The 29 sherds recovered at the Sheeps Bluff Shelter gave insufficient evidence to identify any vessel form. 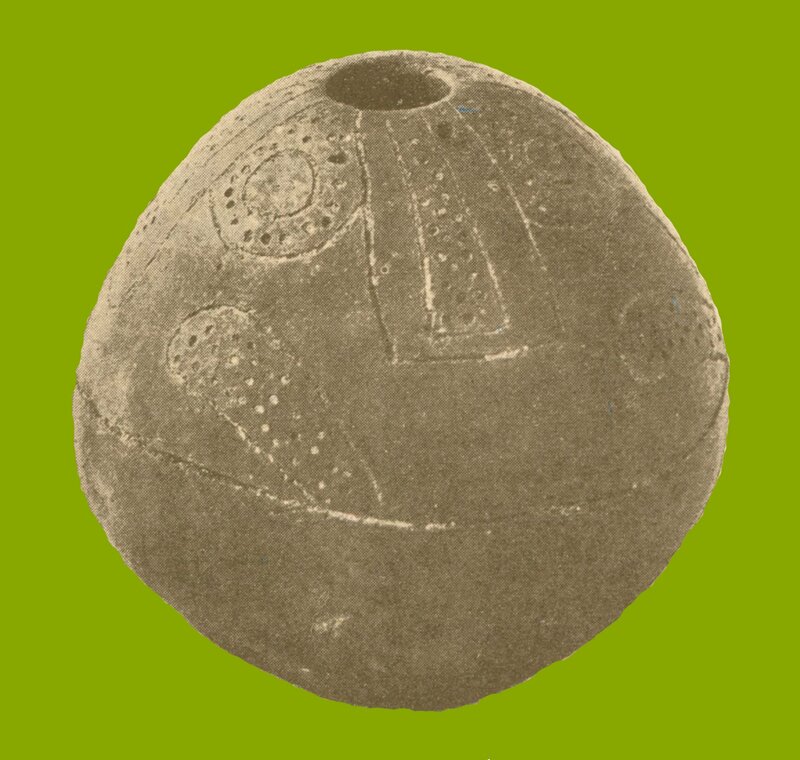 The above example from the Alabama Department of Archives gives us at least a globular jar form with a flaring rim and rounded lips. CHRONOLOGY: Alexander pottery has been assigned to Griffin’s Late Gulf Formational stage in northwest Alabama dating between 500 and 100 BC. 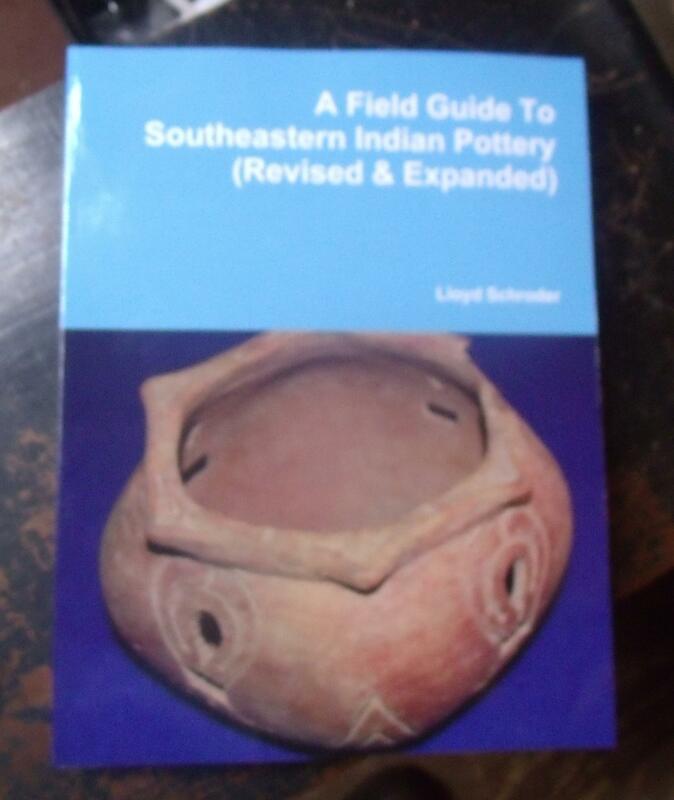 GEOGRAPHICAL DISTRIBUTION: Alexander pottery appears from the area of Carrabelle, Florida to eastern Louisiana and as far northward as the middle Tennessee River Valley and east to the Wheeler Reservoir area. TEMPER: This is a coiled pottery that was tempered with clay particles of varying sizes from fine to 5mm in diameter along with carbonized plant fiber, sand and shell that were perhaps accidental. Sherds are coarse and lumpy and have a tendency to crumble. Surface color is gray, but can also be pinkish, buff or reddish. Cores are gray to black or buff. 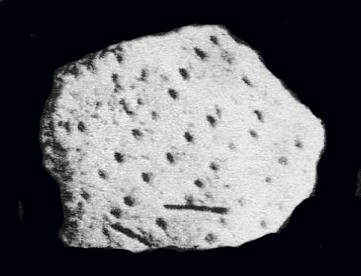 While some sherds are lumpy with particles of temper protruding through the surface, others are well smoothed and some polished with smoothing marks evident. These feel chalky while poorly smoothed surfaces feel gritty. SURFACE DECORATION: Punctations are made with the fingernail and are oval, semi-lunar or hemi-conical in form. Punctations are made at an angle less or greater than 90 degrees to the body wall and are made in rows horizontal to the rim. Punctations are made to push back the clay and are placed in such a way as to have the ridges of clay form lines vertical to the rim. Some examples show three horizontal rows of punctation immediately below the rim. There is little information as to the design of the punctations. Some sherds also show vertical or diagonal pinched bands. 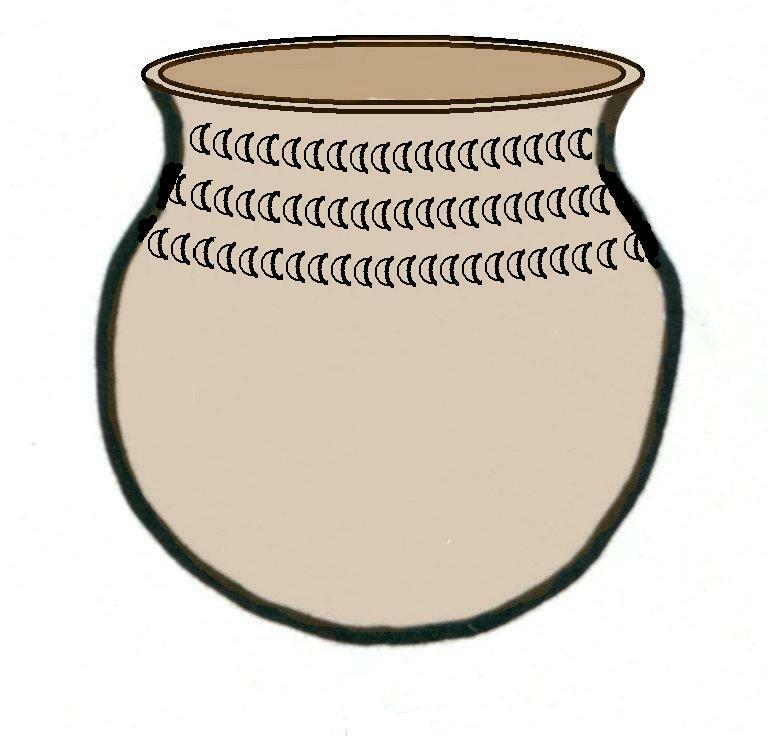 VESSEL FORM: The only vessel forms suggested by existing rim sherds are jars or beakers with a recurved rim, but bowls may also exist. 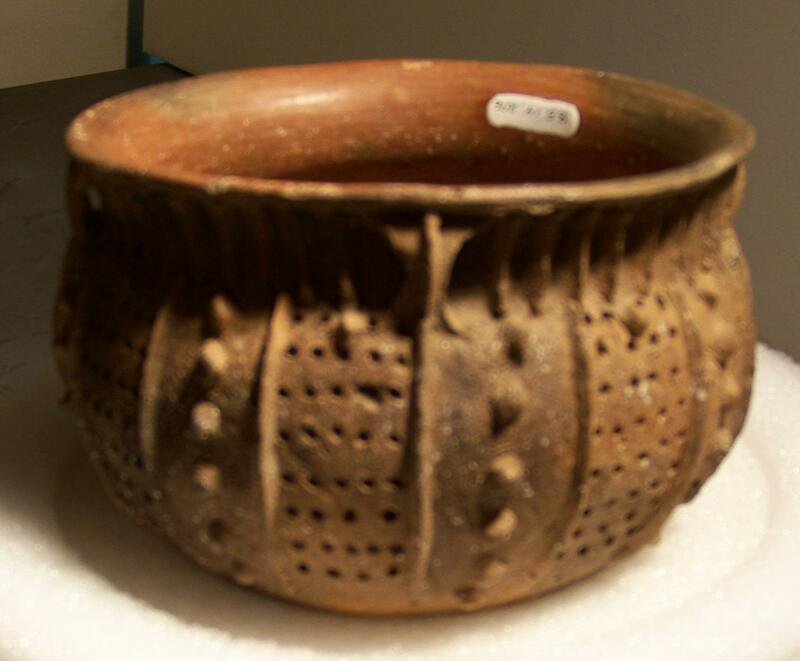 CHRONOLOGY: This pottery occurred as a secondary type during the Middle Woodland, Baytown period. 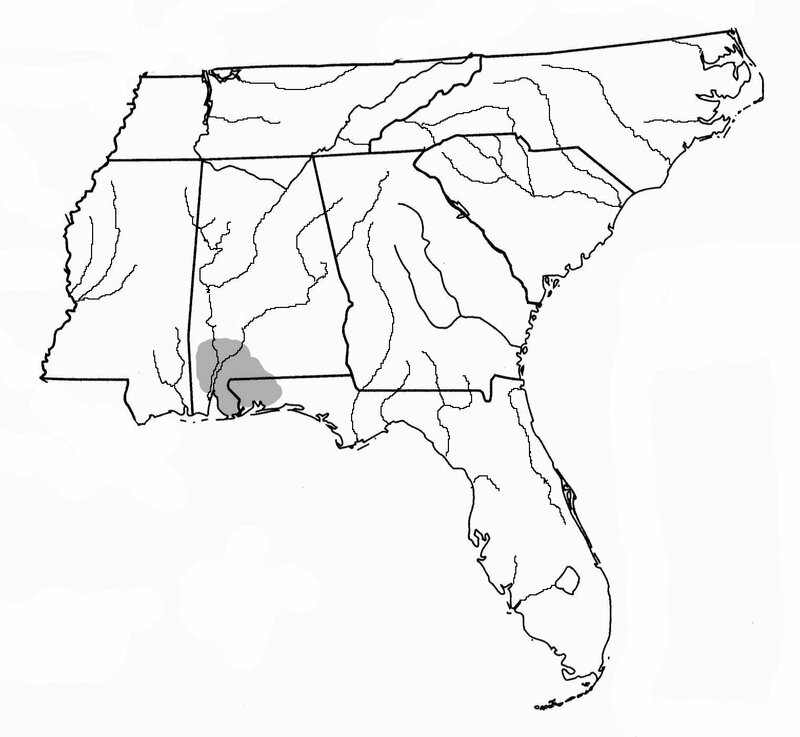 GEOGRAPHIC DISTRIBUTION: Evansville Punctated pottery is known from a number of sites throughout northwestern Mississippi and probably into the adjacent portion of Arkansas. RESEARCH: Steve B. Wimberly discussed this type in 1960,[i] however the type was named by James Ford and Gordon Willey in 1939. Wimberly’s research was done on sites in Mobile and Clarke counties in Alabama. TEMPER: A mixture of clay particles and fine sand were used as temper for this type. The paste colors are usually light tan, sometimes with an orange hue to dark brown, but rarely black. SURFACE DECORATION: Decoration is very similar to Santa Rosa Punctated with broad incised lines that are shallow and U-shaped in cross-section. Designs are sweeping with alternate spaces filled with hemi-conical punctations. VESSEL FORMS: Known forms include beakers and hemispherical bowls. The lips are flat and broad due to an interior rim fold that quickly thins downwards. CHRONOLOGY: Ford and Willey assigned this type to the Middle Woodland, middle to late Marksville period. 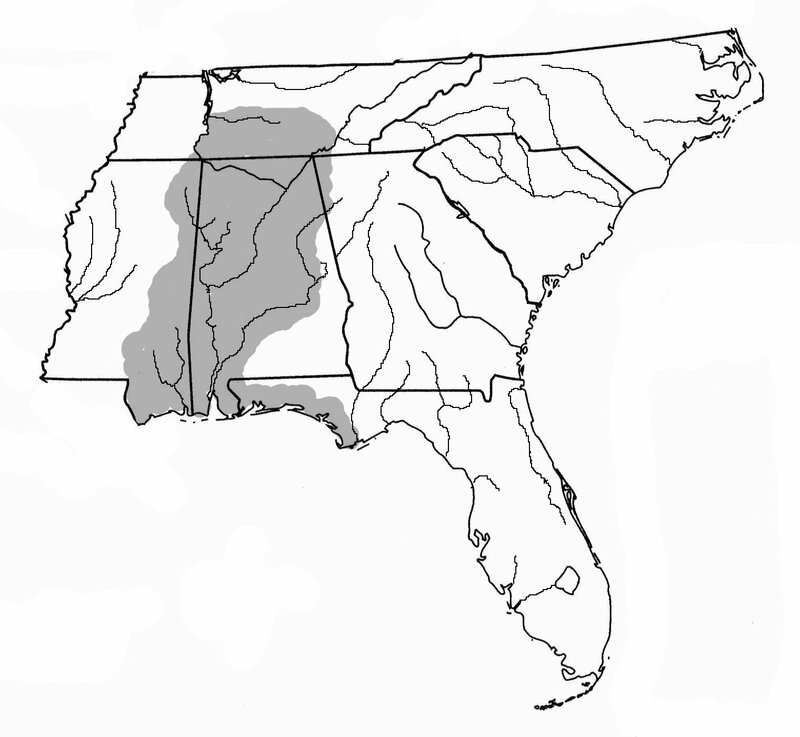 GEOGRAPHIC DISTRIBUTION: As part of the Marksville Hopewellian Interaction sphere, this type might range from southern Mississippi and Louisiana to Mobile Bay and up the Tombigbee River to at least Clarke County, Alabama. RESEARCH: Hollingsworth reported on this type in 1991 from the Sheeps Bluff shelter site. [i] The Sheeps Bluff shelter site, located in Franklin County, Alabama yielded four sherds of this type that seem to date with the Plain type. TEMPER: This type was tempered with plant fiber added to the clay, leaving creases over the vessel surface. Later forms of Wheeler pottery included limestone, with or without the presence of fiber. SURFACE DECORATION: At the Sheeps Bluff shelter, punctated decoration consisted of closely-spaced rounded punctations in relatively parallel rows or randomly placed punctations of the same description. Surfaces are smoothed and show little to no fiber marks. VESSEL FORMS: Louis D. Tesar (1980)[ii] suggested that these vessels might have been fashioned after the steatite vessels that preceded them. The Sheeps Bluff site held sherds with straight rims and rounded lips. 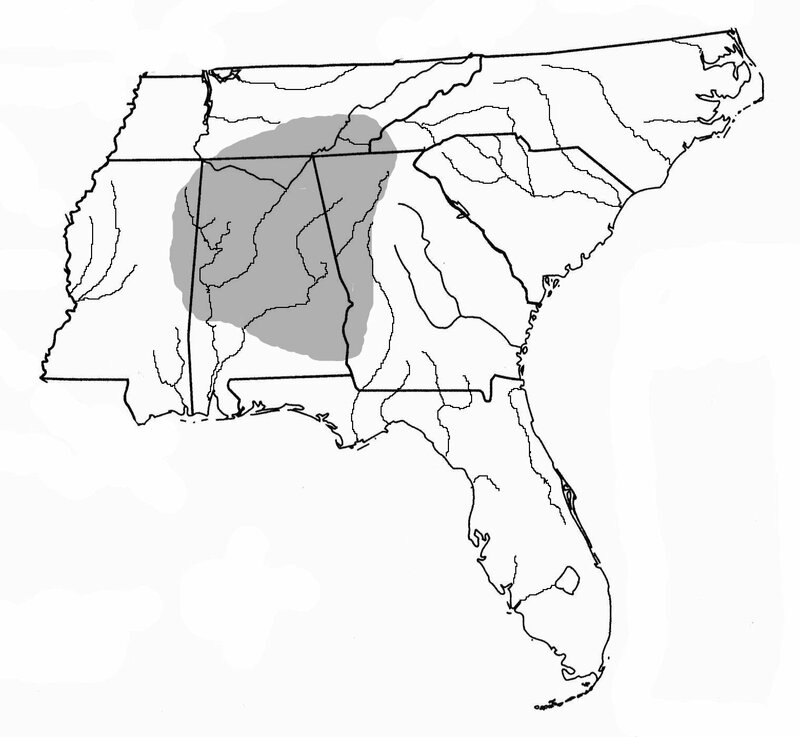 CHRONOLOGY: Hollingworth called this type the marker for the Middle Gulf Formational period in northern Alabama dating between 1200 and 500 B.C. 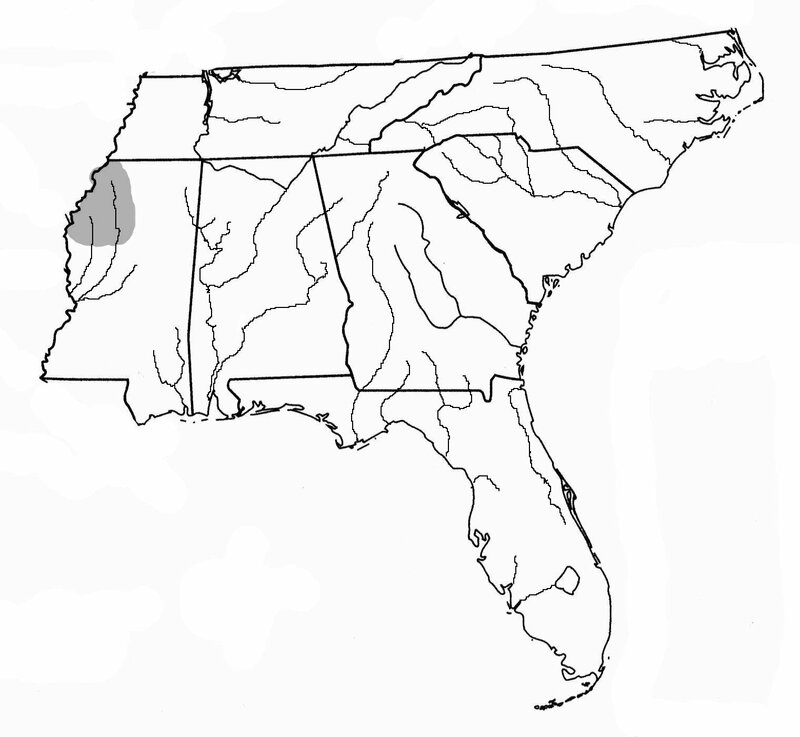 GEOGRAPHIC DISTRIBUTION: Tesar’s estimation of Wheeler distribution included western and northwestern Georgia all of Alabama except southwestern Alabama, eastern Tennessee and western South Carolina.